“Building a game platform for everyone”, Google announces a service to let anyone play games in their browser via streaming direct to their PC. Following the new trend of games as a service (GaaS), Google is working on letting people play games from within Chrome Browser. Competing with current streaming games services such as Utomik, Stadia seeks to bring gaming to everyone, regardless of hardware, as well as connecting the previously separated circles of developers, gamers, and stream viewers. In 2018, Project Stream managed to successfully stream Assassin’s Creed: Odyssey in 1080p to testers around the world, with clean images and low latency, which acted as proof of concept for what would ultimately become Stadia. As an example, Google showed that watching a trailer for a new game could embed a Stadia link for Stadia users to fire up the game and begin playing it, in real-time, within a few seconds. Here a game can be shown streaming and playing seamlessly on low-end laptops, phones and tablets, as well as directly streamed to a TV via a special streaming dongle. 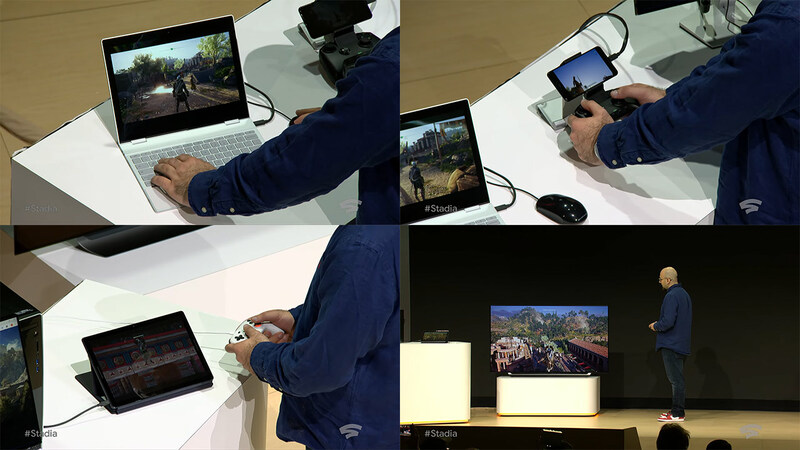 Stadia will come with its own controllers which’ll connect via wifi and can connect directly to modern TVs, though will also be compatible with existing controllers such as DualShocks. Google claim that Stadia will be able to stream games at up to 4K resolution including HDR at 60fps, with Doom Eternal confirmed to be playable at this spec, with the platform ultimately offering 8K streaming in future. Given that Stadia’s servers will be able to scale as necessary to keep up with gaming demands, Stadia promises developers a virtually unlimited base on which to develop games; a world of difference from today, where developers need to keep console and current PC limitations in mind when designing and optimising new titles. Unreal Engine, Unity, and Havok will also fully support Stadia, as well as a suite of commonly used middleware in order to help developers dive into building for Stadia. Stadia will also support cross-platform play, including cloud saves from across other platforms. One of the more interesting new features of Stadia is “state share”, where developers can choose to have a game’s live state — such as player location, inventory, current actions and so forth — saved and stored, ready to be shared and experienced by other players. Another feature will allow content creators to seamlessly choose to allow their followers and subscribers to join their games via Stadia. Finally, Google announced Stadia Games and Entertainment as a first-party studio developing for the new platform. Stadia is due to launch later this year within the US, Canada, UK and parts of Europe.